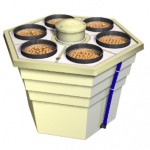 This SuperPonics 16 plant hydroponics growing system combines aeroponics with the ebb and flow hydroponic technology. The resulting combination produces bigger, faster growing, higher yielding and healthier plants that produce 5 times faster than soil grown plants. 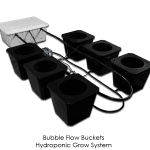 This fully automated SuperPonics 16 Plant Hydroponics Growing System will grow faster than any other single method of hydroponics. 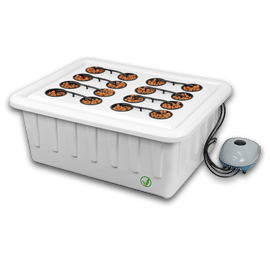 You also get increased safety for your grow because there’s always two independent hydroponic systems operating at the same time. So even if one system should malfunction, your plants will still thrive! Growing your plants with both Top Feed Watering and Bottom Feed oxygenation will create extremely happy plants with rapid growth rates and HUGE yields. SuperPonics grows plants up to 2x Faster than other systems and up to 5x Faster than soil. See why our customers are getting “unbelievable results!” with our state of the art hydroponic unit. Easy to change water with our trademark flow gauge system. Easy to clean and manage.